Okay. There are two types of parents. 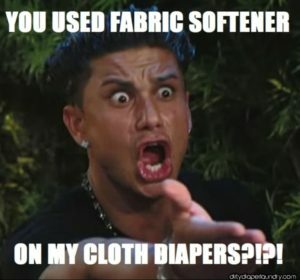 Ones obsessed with all things cloth diapers, and ones who are not. There is literally nothing in between. There are certain problems we can all relate to, and it’s really not what people think. The biggest problem is controlling our obsession. 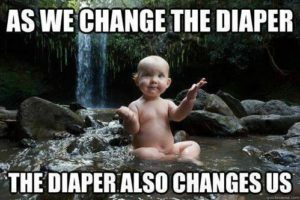 So check out these hilarious memes that will add a little spice to your cloth diaper routine. 1 – I have to admit that I do brag to anyone who will listen that I NEVER get blowouts. I actually experienced one last weekend. In a “sposie” (disposable). While travelling. Lesson learned. 2 – Yes. My little one has her own tell-tale signs. But honestly, it’s no biggie. Just stick that diaper in the wet bag and get on your way. 3 – I mean – the machine does all the work, right? I have a confession to make. I have a weird affliction with laundry, I just really like it. So naturally cloth diapering is no biggie for me – a bit of a cathartic joy, in fact. But even if you hate laundry, honestly, it’s NO. BIG. DEAL. There’s really nothing complicated about it. 4 – I LOOOVE meeting other cloth diapering moms (and dads, I guess…) because we instantly bond about all things cloth. 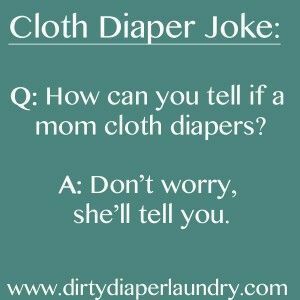 5 – And on that note, we’re always on the lookout for cloth diapering sisters (and brothers, I guess…) so you might not get to hear us shut up about it. 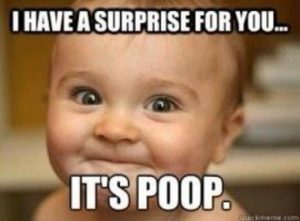 6 – Even the craziest poops are amusing for us CD moms. 7 – Umm. Yes. That’s true. Cloth diaper bums are super super cute. What can I say? They deserve their own spotlight. 8 – Yes. That feeling you get when your baby is forced to wear a “sposie”. 9 – Hahaha. 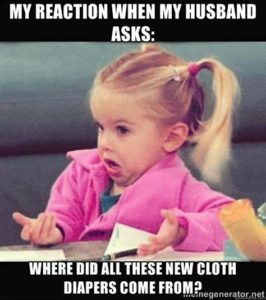 Spending more than necessary on cloth diapers is only an occasional problem. 10 – Well. It’s none of his business anyway. 11 – I said it’s none of your business! 13 – Which is why I won’t be having anyone lose one! 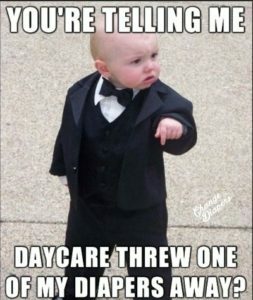 Need a little more parenting humor?